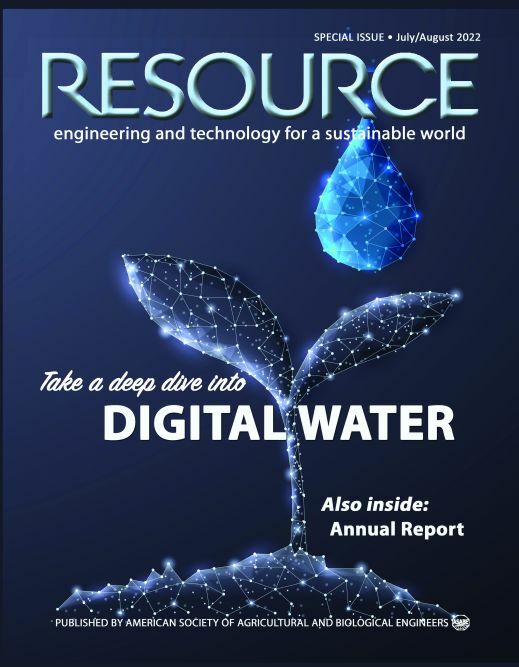 Resource is published six times a year in both print and electronic formats. To subscribe to the print edition, contact the order department. The magazine features trends, new technologies, issues, and applications related to agricultural and biological engineering. Past issues, available below, reflect the many interest areas of our readers. Resource is distributed to all ASABE members and student members. About 500 libraries and other institutions worldwide are also subscribers. Individual articles are occasionally distributed to press lists or other public relations outlets to focus attention on agricultural and biological engineering. Search the magazine beginning with 2004 by using the search engine at the top of this page and selecting the "Resource Magazine" category or use a Google Advanced Search. Share articles in the latest Resource using email, Facebook, Twitter, Linkedin, and Pinterest. Hover over the bottom edge of the page to show the toolbar. On the right side, click on this icon. AE50 (PDF version) - product innovation winners. Capstone (PDF version) - senior design projects. Discover (PDF version) - students and recent graduates of agricultural and biological engineering programs. Explore (PDF version) - students and recent graduates of agricultural systems programs. Guide to Consultants (PDF version) - consulting engineers and services.